Have you ever had a feeling that something is missing? That has happened to me many times. Realizing the bottle of Sweet Baby Rays was empty, not being able to find the perfect song for the car ride, or finding an empty roll of stamps are all scenarios which cause me to have that empty feeling. No matter how often I get that feeling, I can never imagine my life without three things: barbeque sauce, music, and stamps. My obsession with barbeque sauce has been around as long as I can remember. Growing up, you could find me asking for it over ketchup. I would apply it to everything from scrambled eggs, to potato chips. I would always have a mild heart attack when I realized that I would have to go one meal without barbeque sauce. No matter how much prep work I did, we always seemed to run out. Without barbeque sauce, I would have to actually taste the food. Likewise, with music, I have loved attempting to belt out a note, or two, since I was a little kid. I grew up watching American Idol and I was even a “fan girl” of Pitch Perfect. As I got older, I found myself constantly having headphones in or the radio on; as a result, I started to appreciate the sound of music.. Music helped me through many difficult situations: finding the answer to that unsolvable homework problem, enduring through a long drive, or getting a perfect night of sleep. I had to find the perfect song just to make it through. I have lived in three zip codes in the past two years: 47246, 46906, and 46181. My zip code changed frequently, but mail was always constant. While currently living at the Leadership Center, I have come to appreciate mail even more. Although there three giant cell phone towers just down the road, our cell reception is not the best. At the beginning of the year, I decided I would try something a bit different than a typical phone call, or text. I started writing. I would write thank you cards, letters, and even send gifts back and forth to FFA chapters, members, and my family. When I first started writing, I was a bit skeptical. But after hearing how much a card, or letter, can mean to someone, it blew all doubts out of my mind. Now anytime I have a meaningful conversation with someone, or go on a chapter visit, I make sure to use a stamp and send them a note. The best part about this obsession is that sometimes I get letters back. Call me old fashioned, but sometimes I guard the stamps as best I can to prevent a stamp shortage. Today, I know why I feel like I am missing something when I do not have barbeque sauce, music, or stamps. Growing up obsessed with barbeque sauce helped me find my love to cook, so I would not have to cover the taste up with sauce. My constant need to be listening to music inspired me to one day join an acapella group, so I could always belt out a note. Guarding the stamps ensures that we never run out, so that I can always send a letter instead of a text message. Although it is kind of crazy to feel sad when you cannot get your hands on some barbeque sauce, ears tuned into some beats, or runout of stamps for those envelopes, I now know what can inspire passion. Passion does not have to be inspired by some big show, or banquet. Maybe it is not the will to win or the need to have your name on the wall. What inspired passion for me was the small objects that I used every day growing up. I will never be able to get enough barbeque sauce, music, or stamps. What can you never get enough of? It may end up inspiring you to be passionate about something. Gratitude—one word, with only nine letters, containing a huge meaning. Expressing gratitude is sometimes an act we all fall short of perfection on while performing. We don’t show our appreciation for those who have given us so much—parents, siblings, teachers, friends, grandparents, and other mentors. We forget to say thank you, return the favor, or even simply acknowledge that a sacrifice, however small it may be, has been made for us. Recently, I have noticed this as one of my own shortcomings. It became very clear to me the night after the closing session of the first FIRE. 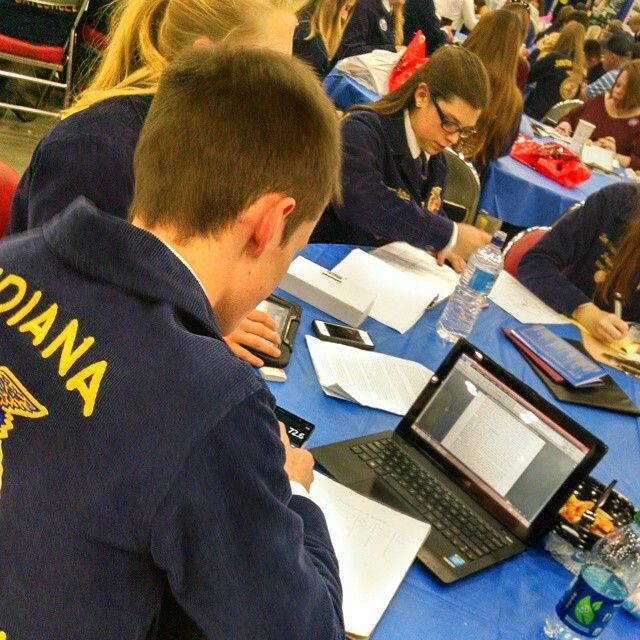 One of the duties assigned to the officer in charge of the opening and closing session is reading all the thank you notes written by the FFA members and then sending them out. These thank you notes were written to sponsors like Farm World and MacAllister, Indiana FFA State Staff, Leadership Center Staff, and guest speakers. During my closing session, I hadn’t really given the FFA members much direction on what to put in the actual thank you notes. Everything written in them was genuinely from their own thoughts and feelings. I couldn’t have been happier with the results. As I read them, tears came to my eyes. The amount of sincerity and thankfulness that radiated from those simple thank you notes blew me away. The definition of gratitude is, “the quality of being thankful; readiness to show appreciation for and to return kindness.” I have never seen that definition more clearly expressed, than in those thank you notes. It was a wake-up call for me. None of my successes, big or small, would have been possible without help from one of my many mentors. I wondered to myself, “Do I always show gratitude to those people?” If I’m being honest, the answer is no. So I’m taking a second right now to say thank you, to offer some much deserved gratitude to those individuals who have given me so much help. Thank you to my family for always believing in me and being honest with me no matter what. To my friends, thank you for loving me even though I don’t always text back. For my teachers, thank you for pushing me to reach higher and be better. Everyone who helped me become the speaker that I am today, please know that I am so grateful. All the people who molded me into the person I see in the mirror everyday—thank you. Who do you need to thank? You can’t get anywhere in life alone. Think about those people in your life who have really impacted you. Take a moment tonight, today, or tomorrow and show them how much you appreciate them. Give them the gratitude they deserve. We don’t know the moment or the hour we will be taken from this Earth. We do not have an eternity to express our gratitude to those we love and appreciate. Gratitude— one word, with only nine letters, containing a huge meaning. It’s something so simple we can give to those who mean the most to us. Don’t withhold that gift. Give the gift of gratitude generously. I think it’s safe to say that everyone has at least one role model, maybe more. These role models may be present in our lives or someone we’ve seen on some form of media. They could be older than us, our same age, or even younger than us. I honestly never thought too hard about who my role models are until recently. 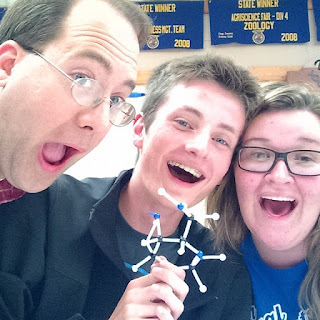 This week I came to the realization that one of my biggest role models was also my friend. Tucker was one of my closest friends all throughout high school. We were in FFA, student council, and on the speech and debate team together. Not only did we do all of these activities together, we were also both the top of our respective classes (he was a year older than me). Everything Tucker did well, I wanted to do just as well. He set the bar high, however. Sometimes I didn’t meet my goal of being as good as Tucker. I never could score or place as high as he did in the Crops Evaluation CDE. I also never reached my goal of beating his SAT score. Other times I far exceeded my expectations. I achieved two of my highest goals in honor of him. He ran for Section II Director the year before I did but didn’t get it. It was a close election with several applicants and I know he did the best he could. When I ran, I didn’t think there was any way I could achieve it because he didn’t. I did, however, and spent the year serving the members to the best of my ability like I knew he would have. While I was running for Section Director, Tucker was running for his highest goal at the time: State Office. I had spent some time that summer helping him and our friend Kelsie prepare to run. I knew that they were well-prepared and awesome candidates, but we also put our trust in the nominating committee. I was there right after he and Kelsie opened their slates. (Spoiler alert: their names weren’t on it.) I saw and felt the other side of slate that night. I cried alongside them because I wanted them to get it more than anything. That night crushed my dreams. How could I possibly become a state officer if they hadn’t? I’m too shy and awkward to even be considered. These were my thoughts following that night. Yet, I still ran and gave my all in those rounds. When it came time to open my slate, I went to the exact same spot Tucker and Kelsie opened theirs the year before. Tucker was even there with me when I saw my name on that piece of paper and again at the induction ceremony. Tucker came as my special guest to the first weekend of FIRE and I saw him again a couple of days later. During this time catching up, I realized it wasn’t all of Tucker’s accomplishments that made him one of my role models. It was how he responded when he didn’t reach his goals. One of the first things he and Kelsie told my chapter after that night was to pass slate. They could have asked us to try to break it, but they didn’t. Of course Tucker mourned after not achieving his dream, but he did it privately and humbly. He was happy for the team that made it and even remained friends with some of them. I have so much respect for him after seeing him go through that disappointment and come out a better person. There is no way that not achieving State Office was a “failure” for him, because he’s thriving where he is. He’s at Purdue now, studying a major he loves, hanging out with cool people just like him, and sharing his tremendous Christian faith with others. His happiness is evidence to his success. So, who is your role model? Are they a positive influence or a negative one? Do they share the same hopes and dreams as you? Is it your goal to be just like them? Are you as thankful for them as I am for Tucker? If you are, take some time this upcoming Thanksgiving to tell them. Because everyone deserves to know that they are looked up to and loved. You never know, YOU might be someone’s example to follow. Are you a good one? Remember, we lead by example. I’m a 6’5” 18 year old male who only weighs 160 pounds. It might not seem like it, but I absolutely love to eat! That might have been one of my early attractions to the Columbia City FFA meetings where Mrs. Furthmiller and Mr. Kimmel never failed to provide a feast of delicious snacks. Food is an interesting thing. Food to me is something that is such a common item in American culture that we often overlook exactly what food does for each and every one of us. Food fosters relationships in ways we might not even notice. For example, it reminds us of people. Whenever I see a cherry pie, I think of my great grandma Gene, whose cherry pie could knock your socks off. Suddenly, the aroma of warm cherries would bring back memories of my grandma sneaking us chocolates with a soft smile of mischief. That cherry pie is so much more than a sweet treat, but serves as precious memories. Food can bring up images of places we’ve been and places we wish to return. If you know me, you know that I adore seafood. Every time I eat seafood, whether it be shrimp, salmon (my all-time favorite), mahi mahi, crab, scallops, or even calamari, I think of the breath taking coast of Topsail Island in North Carolina. That beautiful island is where my family spent a week together every other summer. In a similar way, sweet tea reminds me of home. As I’ve obviously left home this year, whenever I drink good sweet tea I think of my home in Whitley County. I don’t mean McDonald’s sweet tea, I mean a type of sweet tea that only my southern Indiana raised mama could make. You see I was raised in a home where there was always a cold pitcher of sweet tea in the fridge. Sweet tea makes me think of the home I love. Food can mark special occasions! For my 18th birthday, my family went to the BoatHouse in Winona Lake, IN. If you are ever in the Warsaw area, you have to try it out! I remember exactly what I ate that night. I ordered the Bruschetta Pasta with chicken. I don’t remember that meal because it was the greatest meal in the world (even though it is hard to beat). I remember it because my whole family came together to wish me luck before I traveled to the State Officer Candidate Open House. Food creates memories that other things often can not. This year has been full of food as well. 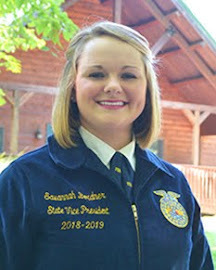 Whether it was the midnight run to McDonald’s after State Officer Slate was revealed, or the trip to Waffle House in Arkansas, this year has been full of interesting moments, often surrounded by food. I remember the wonderful breakfast my grandparents made for the State Officer team before starting our journey around District 7. I vividly remember how flat out amazing the tenderloin was in Brook, IN where we ate at a restaurant called “Earl’s.” I kid you not, it was the best tenderloin I have ever had. If you’re ever in Newton County, look up Earl’s. Whenever we stop in Crothersville, we eat at a local café called “Lucille’s.” They have a spaghetti plate that will make you want to move to Jackson County just to eat it every day. The most memorable moments of this year have been surrounded by some sort of food. Food also brings people together. Our team makes it a point to eat a majority of our meals around the kitchen table. Whether it is the mean Hamburger Helper I can cook up, or the amazing dishes of Sean and Josh, 7 random individuals have become best friends through the food we eat together. Food is a weird thing. It is a necessity in order to stay strong in our physical journey through life, but it adds something else as well. We become stronger not because of the food we eat, but because of the memories we create gathered around the table. National Convention came to a close for us this past Saturday, and it never fails that our busy schedules cause us to turn right back around and head somewhere else. 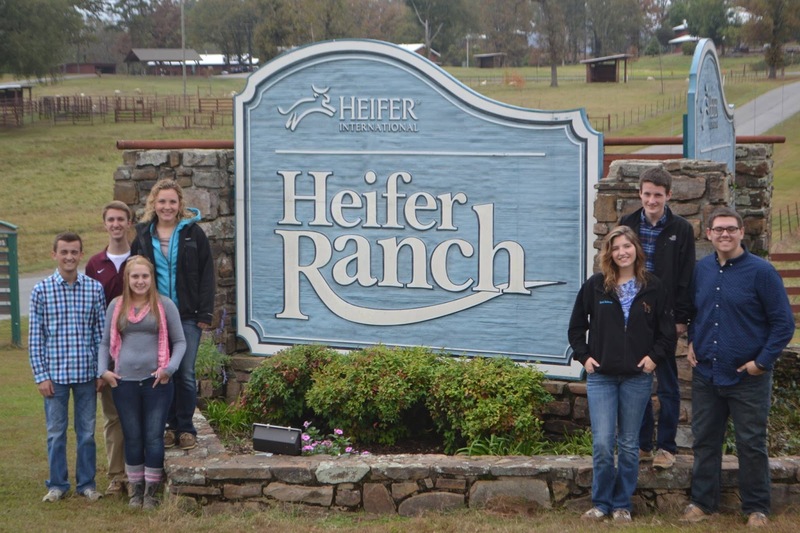 We were to have our fall retreat from November 1st to the 4th, and this year we would be spending it with Heifer International in Arkansas. The team was beyond excited for a new adventure! We began the ten-hour trek to Arkansas on the Sunday after National Convention. We sang at the top of our lungs, slept for hours, argued like siblings over the most random things, and then slept some more. 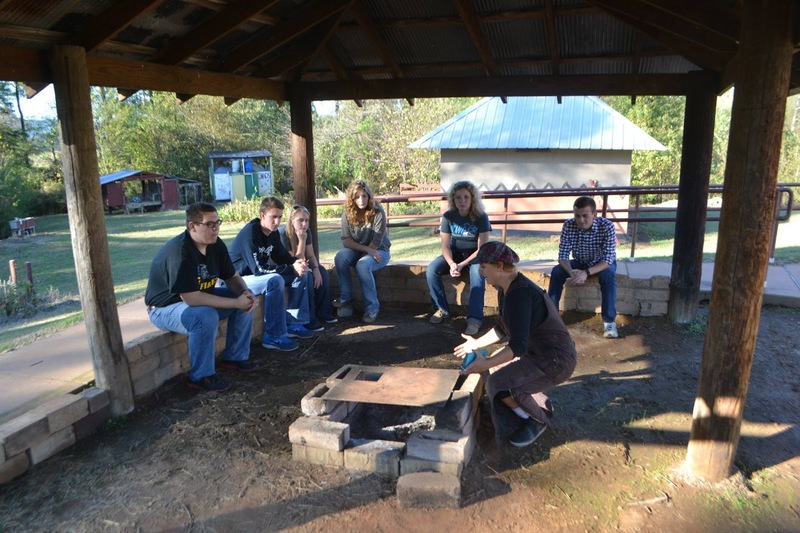 We arrived around 7 p.m. at Camp Couchdale, which is the beautiful center for Arkansas FFA. 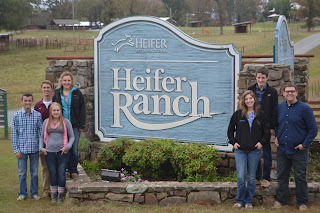 After a good night’s rest, we ventured to Perryville, Arkansas for a meeting at the Heifer International Ranch. We spent the morning working out small details for Read to Feed, our service project, and learning more about the mission of Heifer International. We were having a blast seeing our ideas become reality and putting our plans into action, but I think I can speak for everyone when I say that deep down, we were all slightly anxious for what was to come next. At the conclusion of our meeting, we headed over to the dining hall for a quick lunch, and this is where we met Fin; a very short, young lady in overalls, with the brightest smile and most contagious laugh. She was going to be our facilitator as we went through the Global Gateway program. We went to an isolated part of the ranch, and began our 24-hour simulation. In this area, there were 5 different “regions” of poverty. We began our introduction to the area in the Appalachian region, which consisted of a poorly-constructed wood house that lacked electricity and plumbing. Nearby, there was also a bus with broken windows, animal-infested, and a distinct odor; it was pretty clear that it had never been taken care of. We then made our way over to the refugee camp, which was essentially just a tent covered in wasps and other bugs. Next came the urban slums; a makeshift home without doors or insulation, patched with cardboard and scattered with dirty, wet mattresses. Across a narrow dirt road we found the Guatemalan home, which was sturdily made of concrete, but the structure was all there was to it; there was no furniture with the exception of a few mattresses and a couch, no water or electricity, and all cooking was done on an outdoor fire. Our last visit landed us at the Zambian huts, which were very simple clay huts with rickety tin roofs and a cloth door. At each of these places, we read a real story written by someone who had actually lived under those circumstances, and we discussed the daily struggles that occurred in those areas. With each stop, our hearts dropped more and more with the reality of it all. It only got crazier from that point. Once we had visited the regions, we all sat down together and thought about our daily lives compared to the situations we had just seen. After some small discussion, the real simulation began! Fin separated us into groups of 3; Sean, Josh, and Annalee were to stay in Zambia, Mason, Courtney, and Brett stayed in Guatemala, and Mr. Martin, Mr. Hays, and I were to live in the lovely Appalachian bus. Fin then made this simulation a little more difficult- Josh, Courtney, and I all were “pregnant” (we carried water balloons a makeshift apron), Annalee was blind from malnourishment, and Mason had to live with a rod tied to his leg to signify a critical injury. Each group received a tub with various items; a pot, a small portion of food, and some eating utensils. Fin wished us the best of luck, and we were on our own from that point forward. And I must mention that none of us had our phones, watches, or any connection to the outside world… So it began. We all made our ways to our respective homes to begin planning what to eat and how to sleep. We traded with other groups for food and other various items, and began cooking while we still had some sunlight. In my group, we were lucky enough to have a working stove in the dim and dirty Appalachian house. We cooked up a concoction of rice, a potato, an egg, and some onion- it wasn’t tasty, but it filled us up. Other groups weren’t so lucky and had to patiently cook over an open fire. Once we had finished cooking, we all came together and shared the rest of our food with each other and to see what each group had made. We spent the rest of our time prior to dusk playing card games and avoiding gigantic rats in my Appalachian home. The sky soon became pitch black, and the eery feeling of not knowing the time or what resided in woods of Arkansas crept upon us. It was not long before we made our ways to our homes. Have you ever desired to sleep in a rotting bus? If you have had that crazy temptation, I advise you to change that dream fast. Mr. Martin and Mr. Hays made their sleeping arrangement on the floor and left the tiny seat to the “pregnant” lady. I huddled up in my single dirty blanket, underneath shattered windows and trying to block out the draft of odor and the constant fear of raccoons and rodents trying to join us for the night. It’s safe to say that I maybe slept for two hours, as I froze from the heavy dew that fell throughout the night and worried about my teammates that slept 300 yards away. The sun finally rose and the nine of us came together for a small breakfast of oatmeal cooked over the fire, still freezing cold and all a little grumpy from our lack of sleep. Fin arrived an hour or two later (it could have only been thirty minutes but I wouldn’t know). We milked two goats, did some morning chores, and then came together to wrap up the simulation. It was eye-opening and terrifying for the nine of us, who have been blessed with safe homes and steady living environments, to see the reality in which millions of people live each and every day. I recognized just a tiny portion of the true struggles that a pregnant lady would face day in and day out; the struggle to nourish her baby, let alone her own body, to live in constant fear of the unknown, and I even got a small taste of what it was like to be separated from my family- my brothers and sisters who made me feel safe. My heart sunk. There is enough food produced to feed everyone in the world twice over, and yet billions of people still go hungry or malnourished. We keep our pantries full with things we may never eat, but once that expiration date arrives that entire item just gets tossed in the trash. People really do live like this every single day, and we turn our backs to it. The entire experience of the Global Gateway program through Heifer International solidified my thoughts that it is all about perspective. We often look at the less fortunate and inwardly think, “Why don’t they just get a job? Why do they have a phone, but can’t afford to eat?” It has become our culture to hide poverty behind the latest technologies and the idea that a job would fix their problems, but have we ever thought about this- some people are at the lowest of all lows and they can’t even get to the baseline of a better life? That person may want a job, they may strive for a better lifestyle. They may interview for that job, but they don’t have the clean clothing or means of looking appropriate for the interview. When they fill out a resume, the second line below their name is address- it’s already going downhill due to the fact that these people most likely cannot claim an address. How can they be at their very best when they’re hungry, ill, and living in these circumstances? “When I give you my hand, it’s not for a handout. It’s so you can take my hand and walk this journey together”. Every day, we go through our lives desensitized to everyone else around us. We don’t always think about what it might be like from their point of view. Maybe it would benefit us all if we stop and just take a moment to see it from their perspective, and take action. “Everything speaks everything always.” That is the moral I try to convey while doing a breakout activity during District Kick-Offs. Over the past two weeks, I have spoken to approximately 1,000 FFA members through this activity. While I’m trying to send the members away with something to think about, they’re impacting me just as much as I hope I’m impacting them. Through the responses I receive in group discussion and the comments I get afterwards, I have seen the pain and struggles that many of the students face on a daily basis. But I also see the hope, joy, and determination they have learned through these struggles. The activity I’ve been leading for District Kick-Off is called “Peasants and Kings.” In this activity, each participant is given a playing card they cannot see. These playing cards represent how the other participants are supposed to treat them. Aces are peasants and kings are kings, while everything else gets better in ascending order. I would instruct the students to completely ignore the “peasants,” while the “kings” were supposed to be given lots of hugs and compliments. After five minutes of conversation, the students then have to line themselves up in numerical order based on how others made them feel. Some groups did better than others, and there were a couple of groups who admitted afterwards that they had cheated in some way to get lined up. When there was no cheating involved, there were always several students who were out of order. Most of the time, a student would place themselves lower than what their card was. When that would happen, I would remind them to never underestimate themselves. After everyone lined up, I would tell them to look at their cards and then make a semi-circle around me. This next part is what makes the biggest impact. When everyone is sitting, the discussion begins. The peasants and kings are given the opportunity to share how they felt during the activity. Some of the students don’t take this part too seriously, but the ones who do share things that make my heart hurt. Many of them admitted that they feel like peasants on a daily basis. One student shared a story about his experience moving schools and how he feels much more welcome at his new school. On the reverse side, the students who were given king cards explained that they felt weird being treated like a king because they never get treated like one at their school. After our group discussions, I give the members the opportunity to meet other members and ask me any questions that they might have. This is when the truly heartbreaking things happen. One night, I had a student who was in tears come up and thank me. English is a second language to her, so she struggles on a daily basis understanding and speaking to other people. She thanked me because I had given her a king even though she feels like a peasant at her school. Out of all of the students who shared their stories with me, hers hit me the hardest. These interactions opened my eyes to the reality of exactly what I’ve been challenging the students to do. When I first started working on this activity, I thought that it would be a great reminder to the members. I never realized how much of an impact it would actually leave. “Everything speaks everything always.” The students began to understand what I meant by this when they were ignored. Not only do our words speak to those around us, but our actions do too. When we ignore people, we show them that we think they aren’t worthy of our attention. The more we show others we think that way, the more they believe that they aren’t worthy of anyone’s attention. The opposite is true when we show others that we care for them through our words and actions. If we treat people like they can conquer the world, they begin to believe that they can. And that’s all anyone ever wants: someone to believe that they can do great things. Now that I’ve shared my stories, I leave you with a challenge: Never ever treat anyone as a peasant and always, always treat everyone like king. In this day and age, everyone wants to know what you want to do with your life. They expect a list of schools you wish to attend, the specific major you want to pursue, and the exact corporation you wish to work for. Often times, we are so pigeon holed into what majors we want that we forget the real question: What do you want from life? The State Officer team had the opportunity this past week to travel from District 10 way down south around Evansville, through District 7 in the Terre Haute area, into Lafayette’s very own District 4, and on to the Region’s District 1. It was on this journey through Indiana that I began to think about the question: What do I want from life? Annalee, Josh, and I started our drive on an essentially empty Interstate 69 south of Bloomington. I’ll admit that I was nervous as the modern high school campus emerged from the cornfields of Gibson County for our first visit that day. We traveled on to Tecumseh (pronounced properly in the southern part of our state, “Techumsee”) and then on to Posey County for a visit at Mt. Vernon. 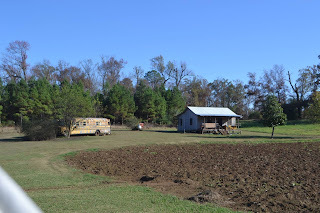 We ventured north through the hills and hollers of District 7 and watched the land flatten to the prairie of northwestern Indiana as we visited the chapters of District 4. All of these scenes provided me with a beautiful backdrop to ponder that question regarding my future. This thought progressed as we traversed to the great plains of Newton County, where I fell in love with the students at both North and South Newton. It was at North Newton that I really found a way to explain what I wanted from life. Our normal activity was slightly off track due to the students not having pencils on hand when we had left the classroom for the library. Thinking on my feet, I had the students raise their blank notecards in front of their eyes. I asked them to picture on the notecard what they wanted to improve in their community. I wanted them to see their “ideal” community on that blank card. This improvisation pushed my brain into gear and I began to think about that familiar question: What do I want from life? It was in that moment in the middle of nowhere Newton County that I looked at a blank notecard and saw my future, my “ideal” life. You see, friends, I was looking at this problem of what I wanted to do in life in the wrong way. I was looking for a beginning to the rest of my life when I really didn’t even know what I wanted the end to look like. Maybe you are in the same pinch too. Perhaps you are looking for a beginning when you don’t even know what you want in the end. I challenge each and every one of you to pick up a blank notecard right now. Look at that 3” x 5” rectangle full of possibility and picture your “ideal” life. Envision the legacy you want to leave. On that notecard, paint the life you want to look back on some day and say, “I’m proud of the things I did.” What do you see on your notecard? What does that future look like? Do you see it? Awesome! Now, go and seize it. This past week, our team spent three days in facilitation training, sharpening our skills and preparing ourselves to head off this upcoming week to chapter visits and district kickoffs. As we watched video clips to learn different stages of emotion, a few minutes of the movie Miracle played. For those that haven’t seen Miracle, Coach Herb Brooks leads his hodge-podge U.S. hockey team into an Olympic victory over the Russian team. At that point in the movie, they were in the locker room, about to venture onto the ice rink for the Olympic championship games. Coach Brooks walks in, and gives one of the most powerful speeches I have ever heard. In this motivational pre-game speech, he says the simple quote I included above- “Great moments are born from great opportunities”. It seems as though we blinked and the month of August had disappeared; 27 days of the great Indiana State Fair flew by and before I knew it, we were whisked off to Decatur, Illinois for a few hot, but exciting, days at the Farm Progress Show. The seven of us had an absolute blast meeting people from across the country and learning their stories. 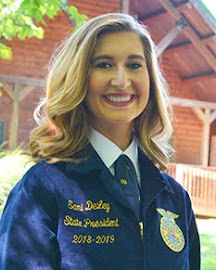 My personal favorite was meeting Past State Officers and talking about the changes that have occurred in FFA and seeing how much pride they took in our beloved organization. We all live very busy and chaotic lives. I know for our team, we are always working on the next project or traveling to somewhere new, but we love our late nights at home together, jamming to music while laughing nonstop; inwardly recognizing that time truly does fly. Life goes at such a fast pace that it seems to pass before we can cherish it. But, one of the most important things I’ve realized in just the few short months is that NOW is the greatest time for opportunity. This applies to everybody-- no matter what stage of life you are experiencing. Maybe you are a freshman in high school realizing everything FFA has to offer you, and feeling a bit overwhelmed. Maybe you are a senior in high school dealing with college applications, studying for the ACT and SAT, feeling stressed to whole new levels. We all feel pressure to achieve, succeed, and get ahead in life. We want to find those great opportunities to create great moments. However, we must not forget to experience the little moments in life that count most. The smallest opportunities can have the biggest impact. Watching scary movies on the couches, having nerf gun fights in the office, and eating hot pockets together as a team are moments I will remember for a lifetime. In this crazy, action-packed life, it is a complete necessity to stop and experience each moment to its full extent. If we don’t stop and take that time, we won’t do justice to the great opportunities and great moments we earn through our hard work. Receiving a banner, winning a scholarship, and being named number one are all great instances in life. However, we must not forget to live in the NOW. Every time the clock ticks forward, another second of our lives is lost to eternity. Time is not gained, only lost. Look at every second as though it is a new opportunity to create a great moment-- big or small. Explore. Expand your horizons, and look at the world from different perspectives. Every single day is a rare and unique opportunity; be sure to seize that. 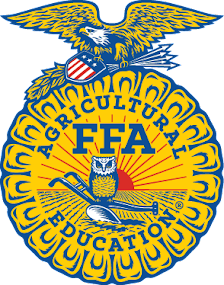 The list of stereotypes for individuals involved with Ag Ed and organizations like FFA is a long one. Sadly, those same stereotypes are often what keep students from taking an agriculture class in the first place. It was those stereotypes that were in my head when I sat down for my first day of introduction to agriculture class in eighth grade. 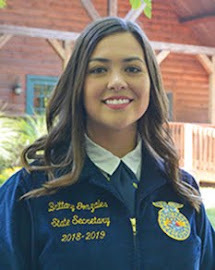 Since that first experience in middle school, agricultural education has changed my life. What I learned from that first experience in ag education and my following 4 years of taking ag classes had not been what I was expecting. I studied biology, engineering, business, and much more all in the same classroom. I got the chance to apply concepts I was learning in all of my other classes to real life situations. I learned about myself, my strengths, weaknesses, and where I want my future career to take me. 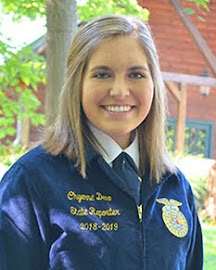 By remaining involved in agricultural education and joining FFA, my efforts led to 4 appearances in the National Agriscience Fair. 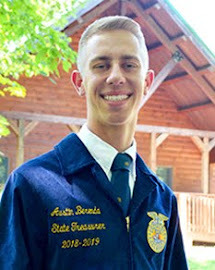 Ag ed and FFA allowed me to travel and learn about agriculture outside of my community. Because of my experiences, I have been able to network and create relationships that I know will last a lifetime. Most importantly, I learned how the United States goes about producing food to feed a rapidly expanding global population. At the end of the day, agriculture is food. It’s what we eat. 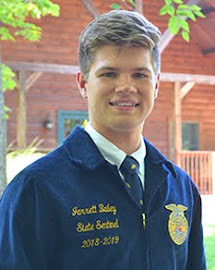 By being involved in agricultural education throughout my high school career, I have a much greater understanding of where my food comes from than I ever did before. It doesn’t matter if you live in a city, the suburbs, a small town, or the middle of nowhere. At some point, you are going to need to eat. Now, more than ever, a spotlight has been shined on our food and how it is produced. Across the United States individuals are taking an active interest in the steps it takes to get food from the farm to the table. When it comes to finding that information, I could offer you a list of twitter accounts, blogs, and magazines all dedicated to showcasing food production. However, my best piece of advice? Take an Ag class. There is no better way to learn about food production, and so much more, than agricultural education. No other subject can combine learning about science, technology, engineering, and math like agriculture does. At the end of the day, agriculture plays an extremely important role in the life of everyone on the planet. That’s why it’s important to be properly educated about agriculture. It’s not just for people who have been raised on the farm, or those who want to one day be directly involved in the agriculture industry. Agricultural education is for everyone. State fair is one crazy experience. From breakfast with Lieutenant Governor Sue Ellsperman, to lunch with Senator Joe Donnelly, my teammates and I got to have conversations with our state’s finest leaders. After each of these conversations, we could be seen smiling from ear to ear as we excitedly ranted about our experience. We were always fascinated that these fine leaders had taken time out of their day to listen to us. They even shook their heads and smiled as we nervously told them about our future plans! It was great! They took time to listen to what we had to say, and that meant the world to us. On the second day of the fair, I was on playground duty. As I was picking up some Tonka trucks, I noticed a man wearing a Chicago Bears hat. Being a Green Bay Packers fan, I had to inform him that he had a horrible taste in football teams. Luckily, he was a good sport about it and we discussed the heated rivalry between our teams of choice. Our conversation turned from football, to my hometown, and ended on the topic of FFA. We each shared stories while the other one listened intently. As I walked away, he thanked me for taking time to talk to him. A few days later, I was sitting in the animal wing selling carrots. A man working at the AgrAbility booth walked over to introduce himself to me. One thing led to another and then he began to share with me the reasons why he was advocating for disabled farmers. His story was incredible. He was a burn victim. The only part of his body that was covered by his own skin was his face. I was fascinated at what this man had been through. I did not get to say much during our conversation, but I could tell that the man just needed someone to talk to. The next day, as I was sitting in the Caddyshack, an old man approached me. I could tell by his worn out, faded overalls that he worked at Pioneer Village. He asked if I was a state officer. I told him I was, and he immediately began telling me stories about FFA back in the day. The old man, Jack, led a delegation of FFA members in a covered wagon from Northern Indiana to Louisville for national convention. This storied wagon still sits at the Leadership Center today. Jack stopped back by the pavilion many times to check in on a project that he had given us. Each time he would tell many of the same stories, but seeing the joy that these stories brought him made it worthwhile. I learned many lessons during state fair, the importance of listening being the most valuable. Your title does not impact someone’s life, your ability to put their needs before your own, does. Sure, I had to pee during Jack’s long stories, but walking away was not what I wanted to do. I have no way of knowing if my conversations with these people meant anything to them, but I can only assume that they enjoyed me listening to them as much as I enjoyed Sue and Joe listening to me. Small, extraordinary acts change the world. You don’t have to speak to be remembered. As materialistic as it may sound, I love opportunities to get something new. 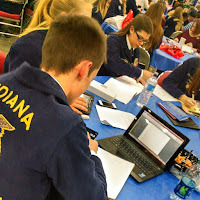 Whether it is new shoes the week before school started, trying a new Skittles flavor package, or even a chance to meet eleven thousand Indiana FFA members, these types of opportunities can come and go if you do not take advantage of them. The most recent opportunity my teammates and I have had the pleasure of getting is right here at the Indiana State Fair. Givingchange for animal feed, passing out putt-putt clubs, and coloring pictures with kids. This opportunity is something that my team and I had been looking forward to for a while. Now, if you have never been to the FFA pavilion allow me to describe it. First we need to imagine a huge tin building, now let us place a few things in it. A greenhouse, a small square roomwith wooden walls to buy FFA apparel, a good sized children’s playground, eighteen holes for putt-putt, an animal wing with sheep, goats, and cows to feed, two sets of triangle with various FFA displays, a market where all Indiana produced products are sold, and last but not least a wooden structure labeled “Caddyshack.” Words do not do the FFA pavilion much justice, but there is honestly a lot for people to do here at our exhibit. Just seven days into the fair, I have been able to see young and old alike take the time to enjoy the Indiana FFA Pavilion by seizing those opportunities provided. One example I saw in the midst of a busy $2 Tuesday was a little blonde haired boy putting with his mom and dad. Mom was pushing the stroller and dad was helping this boy “line up his ball” to ensure he made it in the hole. However after about ten putts the lime green ball was still not in the hole, but I could see the determination on this little boy’s face – he was going to sink that ball! Finally after using the putter forwards, backwards, and sideways I heard a zealous squeal, saw two raised fists of excitement, and witnessed the world’s biggest hug from dad. This little boy achieved success in his mission to sink that ball in the hole, and the joy on his face was payment that I did not deserve. By we as Indiana FFA taking some time out of our busy schedules to help set up, work, or organize the pavilion we all had a hand in bringing that little boy some joy. As hectic as the Indiana State Fair is sometimes, seeing this little boy take advantage of the opportunity of putt-putt is rewarding. Opportunity and reward sometimes goes hand in hand. In this case I saw the reward first hand. However, many things we do in this organization and also our communities will go unrecognized. That should not be the determinant of how much and why we grasp out at opportunities. You are the difference, you can make a difference, seize the opportunity. How do you feel when you have accomplished a huge task? Relieved, satisfied, calmed, or pleased? After tackling State Fair Set Up, all those emotions could be used to very accurately describe the state officers. The feeling of finishing the FFA Pavilion is indescribable. The pavilion starts out completely empty. It is used as a storage space for the State Fairgrounds during the year. Every landscaping block, flower, and freshly painted wall is crafted in a matter of 10 days. This herculean effort could not be accomplished without the help of FFA members from across the state. The team is so appreciative of every chapter and district that came out to help. We couldn’t have done it without you! Especially because this year many changes were made. 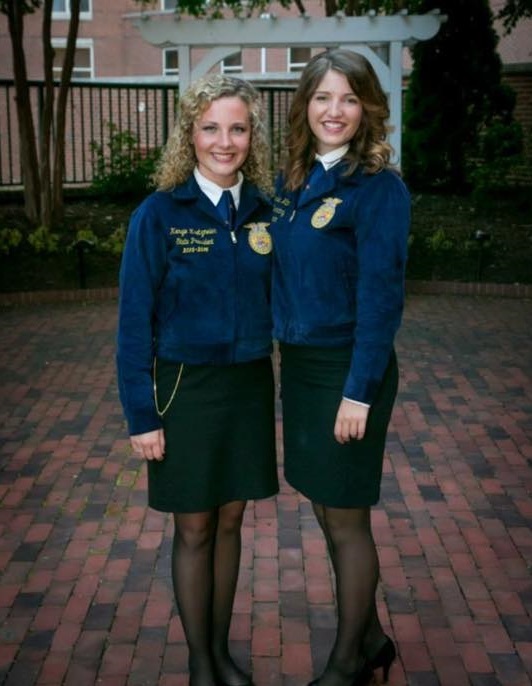 Every State Officer Team has the power to better the pavilion in new, creative ways. Specifically this year, Josh renovated the entire child’s kitchen. It is now the Blue and Gold Market. 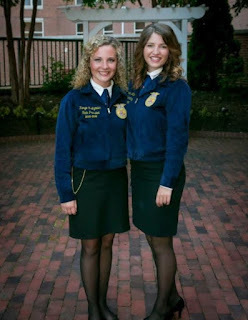 The Blue and Gold Market offers a wide variety of FFA apparel and other items. My personal favorite is definitely the jewelry. The bling necklaces are amazing! Come check it out and go shopping FFA style! In addition to the Blue and Gold Market, Mason and Courtney also redesigned the Putt Putt Course. With the help of numerous, dedicated FFA members, we were able to move the greenhouse and put an entire Putt Putt hole inside it! Also with the support of Tractor Supply Company, we added new decorations to the course. The best way I can sum it up is the FFA Pavilion is looking better than ever. Today is the first day of the State Fair. It feels so surreal looking around at all the improvements being enjoyed by all the fairgoers. All the work we put into setting up is paying off tenfold. It’s incredible how quickly time is flying by us. We are all so excited to enjoy every moment of the Great Indiana State Fair. We hope you come out and visit us and the pavilion! The word strength is defined as “a good or beneficial quality or attribute of a person or thing.” When someone talks about strength, it can be used to describe physical strength, one’s mental/emotional state, or the ability to do a task better than average. Regardless of what you relate the word “strength” to, every person possesses numerous strengths that deserve to be recognized. Back when my teammates and I went through Blast-Off training, we had the opportunity to learn about each other’s top five personality strengths. However, we never really had a chance to see these strengths in action before this week. As we started planning for the state fair, each of my teammates’ individual strengths began shining through. There are those who can visualize color relationships better than the rest. There are others that can visualize how areas should be spatially set up. There are still others who are experts at organizing. Knowing this going forward will make planning other activities as a team much simpler. While the opportunity to learn more about the strengths of my team was an awesome experience, seeing the strengths of the members who came to set-up days yesterday and today was much more eye-opening. I was amazed by the number of students who were experts on power tools and by the ones who were knowledgeable about pressure washers and building things with table saws. Not only were the skills and personality strengths of each individual useful, but the physical strengths were as well. There were tall and muscular students who were able to carry heavy putt-putt holes with no problem, as well as short and slender students who were much better fits for small spaces. The real lesson to be learned about strength is how to appreciate and utilize it. Many people don’t realize the importance of their strengths, or may even be ashamed of them. If this is the case, those strengths get locked in a box and become useless. What the owner of the strength in the box doesn’t realize is that they are actually hindering the progression of the group because they possess the skill set needed to work quickly and successfully towards the goal, but still refuse to utilize their strengths. Therefore, I challenge everyone to embrace the qualities that are your strengths so that they never become locked away and unused. It’s when we are the most unguarded and willing to share our strengths that the most effective teamwork takes place. Whatever you do, just let your strengths shine! Standing on Capitol Hill in Washington D.C. is an empowering sight. The white marble buildings embody the very essence of power and tradition. Kenzie and I had the chance to experience this sight this past week at the State President’s Conference. We have experienced D.C. in a new way with our new friends. We have collaborated on delegate work with other State Officers from across the nation and the Virgin Islands and Puerto Rico. It has been an amazing adventure; one that we will never forget. Standing on Capitol Hill I realized what had made this trip so amazing. I was surrounded by old buildings that had stood for over 100 years. What made them so strong—their foundations. Each building has a strong foundation, holding it up through the years. Each State Officer at the State President’s Conference also has a foundation. As people, our foundations are our values. The reason Kenzie and I’s trip has been so amazing is because we got to spend the week with people who shared the same values as us. Obviously each of us have slightly different values in our everyday lives, but as agriculturalists we all share similarities. We all value agriculture. We value problem solving. We value service. Our values are an important part of our story—personally and agriculturally. When we advocate for agriculture, we can spout off information and facts all we want, but the most powerful thing we can share is our values. How do we effectively share those values we all obtain? It is as simple as this: ask, listen, and share. When talking to others, ask what they see as their core values and discover what is of utmost importance to them. As people portray their passions and show what their heart beats for, listen in order to learn. Active listening is key to actually understanding others. After identifying their values, respond by sharing what you stand for. Relate your values back to them. Allow them to look at your personal beliefs and understand where you are coming from. By doing this, we are able to display the true meaning of the agricultural industry. Instead of using cold, impersonal facts and information, take a different viewpoint. This is where we as agriculturalists sometimes fall short. We rely too heavily on science and data. We need to rely on sharing our unique ag stories and the values that go with them. When we clearly convey our values people listen. They can relate to us and our industry. Ask, share, and listen—this is how we effectively advocate. Picture yourself on a boat. It has a motor, a covered top, and is drifting across the ocean. You can see an island on the horizon just barely a shade of green. The water is clear enough so you have no idea how deep it is. You walk to the edge of the boat to get a closer look, and you slip. That adrenaline, the shear second you lost your breath, is just a rush of emotions that your brain cannot comprehend all at once. For my teammates and I the last month has been full of moments like that slip on the boat. With state convention right around the corner, I finished up my freshman year at Purdue University with a study abroad in Jamaica while my teammates concluded their high school careers with graduation. 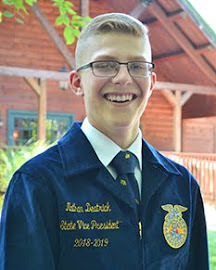 Shortly after being elected, we loaded up with Mr. Martin and headed south to Lexington, Kentucky, for National Leadership Conference for State Officers. We dove right into training about how to work as a team and what is it like to actually do something worthwhile with our time of service. Little did I know that learning names would be so hard right off the bat, because we were at NLCSO with five other state associations. There were state officers there from Michigan, Kentucky, Tennessee, Georgia, and Arkansas. A total of fifty three state officers were in attendance, but I only barely knew six of them. As we started training that week I tried to keep myself in that “slip on the boat” moment. I felt like my breath was taken and my body was full of adrenaline every time I met someone new, because that was the way I had decided to remember names. I would associate some crazy moment with each person I met. For example I met this kid Daniel from Michigan, so I immediately thought of the Daniel and the lions’ den story from the Bible. I had no problem remembering Daniel’s name because I just kept that thought of excitement in my mind. I think that this name learning technique is something small on a larger scale. What if I kept this thought of having adrenaline-filled and breath taking experiences throughout my year of service? Well, I did a small scale test and tried to face each day of BLAST OFF training with this mindset, and guess what happened. I took that week of knowledge and broke it down by relating it to something much more than just training. As a team we learned about our own personal strengths and I kept thinking about my top five talents as pieces of an Iron Man suit. At that moment I know that I had struck gold! I was able to take something so simple, as names or even personal strengths, and turn them into moments that made my heart skip a beat. I think that could mean something to Indiana FFA. If my teammates and I can complete our year of service always having this mindset, I know we will truly leave an impact. I also know that the initial thought of slipping on the side of a boat will be nothing compared to what could be done with the same mindset.